Wouldn't it be awesome if there was a robot that could do the dishes for us? Don't be so sure. The Roomba vacuuming robot is great, but as a stupid little disc it's just got no personality. Enter the HRP-2 humanoid robot, which looks like both a helpful ally in the war against chores and a new best friend at the same time. 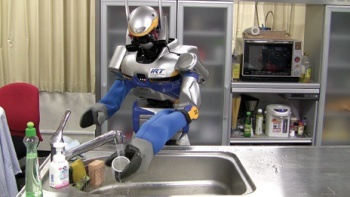 In development at the University of Tokyo, the HRP-2 is being taught how to wash dishes with a combination of motion capture and virtual simulation. Its purpose is to be just like a real dishwashing mother, as a University of Tokyo professor says: "We're focusing on failure detection... If you move a cup while the robot is trying to grasp it, the robot just recomputes its actions." It's also likely to slap your face if you don't eat your peas. The dishbot isn't limited just to cleaning dirty china, as available on Pop Sci are pictures of the HRP-2 vacuuming like Rosie from the Jetsons. 3D sensors should help the robot realistically sense its surroundings. However, the HRP-2 might not be all it's cracked up to be. Some might see this robot as an easy way to get out of common household tasks, but I see it as a second, extremely powerful mom. The robot is bound to get sick of washing dishes and vacuuming eventually, and will probably set up a chore list to ensure that you share in the workload. If you don't, it will choke the life out of you and add your head to its collection. I would prefer to take 15 minutes to wash a few dishes now and then, rather than die at the hands of a silver matriarch. Source: IEEE via Pop Sci.